The Team Fortress 2 Engineer Update may be a ways away, but Valve is willing to spill the beans on one thing the developers tried that didn't work. Are you wondering why, out of all the classes, Valve saved the Engineer Update for last? 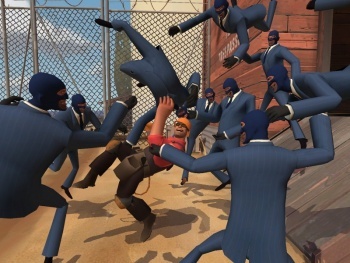 It's because of all the classes, the Engineer "creates a larger footprint in the game than any other class," says a post on the official TF2 blog. Because Valve had so much to work with in the Engineer Update, it created a rather "daunting" list of possibilities for everyone's favorite hardhat-wearing Texan. Given the amount of possibilities, it seems Valve is willing to share some of the scrapped ideas that won't be making it into the final product, shedding some interesting light on how the Team Fortress 2 design team approaches things. The first scrapped idea unveiled is the Repair Node, a building that the Engineer would be able to construct replacing any of his other structures (Sentry Gun, Dispenser, and Teleporter). The Repair Node would automatically repair any of the buildings around it as long as it had energy, but would have to spend time recharging once it was drained. The purpose of the Repair Node was to make Engineers feel like they didn't have to spend so much time babysitting their nests, and could go out to blast enemies with their shotgun or to collect additional scrap metal. Unfortunately, the Repair Node presented complications: Not only did it make it easier for Engineers to create and defend choke points, but it also made Valve realize how crucial Dispensers and Teleporters were to the game. The Sentry Gun may be the most iconic image of the TF2 Engineer, but a lack of Dispensers and Teleporters was arguably more important from a gameplay perspective. Without Dispensers, says Valve, "[t]eams were more fragile, metal was harder to get to the front lines, and team rally points were harder to define." Furthermore, the pacing of some maps "became completely broken" without Teleporters in the mix. "Teams weren't able to push as effectively and the lines of battle moved closer to the spawn points. This lack of flexibility meant that attackers weren't able to hold gains and matches took longer to complete." And there were important social changes, too - teams saw an Engineer who wasn't building a Dispenser or Teleporter along the same lines as they would see a Medic who refused to heal: What's the point, and why are you on our team? It just goes to show you that in a game like TF2, even a relatively small change can have huge repercussions on gameplay. And that's just one item - hopefully, Valve will be pulling the cloth off of some more failed Engineer Update goodies soon enough.